With Ms Buthaina AlKhan, partner, Dantell. Bringing in the beauty and legacy of Turkish lace and embroidery works to the homes in Bahrain is Dantell, the dream come true for ‘double cousins’ Ms Maryam and Ms Buthaina. 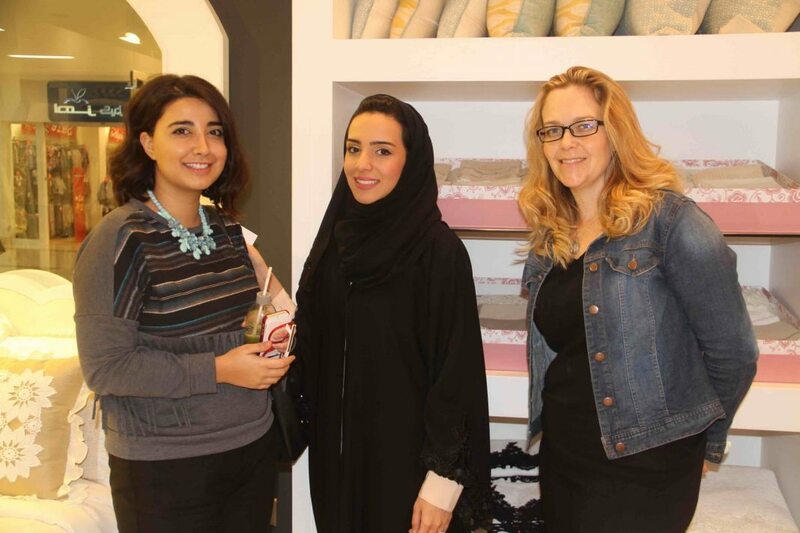 The new showroom opened at the ground floor in Seef Mall has soon become the hot spot for the conventional and chic within days of its inauguration. Taking time out from her busy schedule, one of the partners, Ms Buthaina, sat down with BTW sharing the excitement of being the first franchise of Dantell. Congratulations for bringing the goodness of Dantell to the Kingdom. How did you get the idea? Thank you for your kind wishes! Well, I was in Istanbul for holiday with a group of friends. Walking down the Grand Bazar, one of the largest and oldest covered markets in the world, where they sell all sorts of things, from food items to accessories, textiles, exotic skins and many more, I turned to my left and there stood Dantell. Walking through the busy crowd with people bargaining around, this boutique stood out, so bright and chic that it immediately grabbed my attention. As I went inside, I fell in the love with the products on display. Since I was moving into my new home I purchased all sorts of textiles and accessories. When I asked them for other boutiques around Istanbul they were kind enough to direct me to some of the best names in the place. With a number of home accessories brands in Bahrain, how is Dantell planning to be unique? In today’s society, we have many people who are getting married, delivering a baby, or moving into a new home. Maryam and I had many times struggled finding the perfect gift for our friends on their special occasion. With Dantell, we aim to fill in this gap, by carrying affordable products that are suitable as gifts for any occasion. Almost every piece you would find at our store is embellished in lace or embroidery of neutral colors that would look fabulous in any and all home. Even though there are many home accessory stores in Bahrain, there is a lack on one that covers all aspects of home grooming textiles. At Dantell’s, we provide customized services on the textiles by embroidering names or initials on to the materials. Tell us a little more about the brand. As you may know, it is a Turkish brand that’s been established in Istanbul in 2011. The owner was 27 years old when she started off this business. In Turkey, they love lace. It is a vital part of their traditions and therefore they wanted to carry it onto future generations and give it a modern touch. We specialize in bed linen, towels, bathrobes, cushions, tableware and others textiles and accessories. All the products at Dantell’s is inspired by the 19th century Ottoman designs. Do you personally check all the items being brought to the store? Well… the first couple of times when we placed orders for our store, we flew to Istanbul and handpicked the items ourselves. Although now we find it easy to do through our online catalogues. But whenever necessary we are prepared to fly to Istanbul and assure of the new designs and patterns reach the Bahrain market as well at the right time. This is the first Dantell franchise in whole of Middle East. What is the next thing in your agenda? Yes, ours is the first franchise in the Middle East. Actually this is the first Dantell franchise outside Turkey. We have many expansion plans for the business that we expect to take beyond our store. We have plans to cater to the accessory requirements of hotels and the marine line as well as provide quality rentals for events like receptions and other parties. Your shop design itself is a masterpiece. Who is the brain behind the design? Knowing that our store is a franchise, all designs had to come from the head office in Turkey. They sent us drawings of the furniture along with the color codes and wall paper selections to match their items. With the help of Worldecor, our contracting company, they designed floor plans according to the space we had and bought alive the store ideas that Maryam and I had. After years of hard work, you have finally got your dream come true. How do you feel about it? After all these years we are happy and proud to have found something that interests us both! It surprised us that the hardest part is to decide on to begin something and once you get into it, all just falls into place. It feels so great to have Dantell opened for Bahrain and we sincerely hope that the people here would love it and it will be a success!